I'm something of a chocoholic so, when I was offered the opportunity to review a couple of items from the Tesco Chocolate range I didn't think twice. 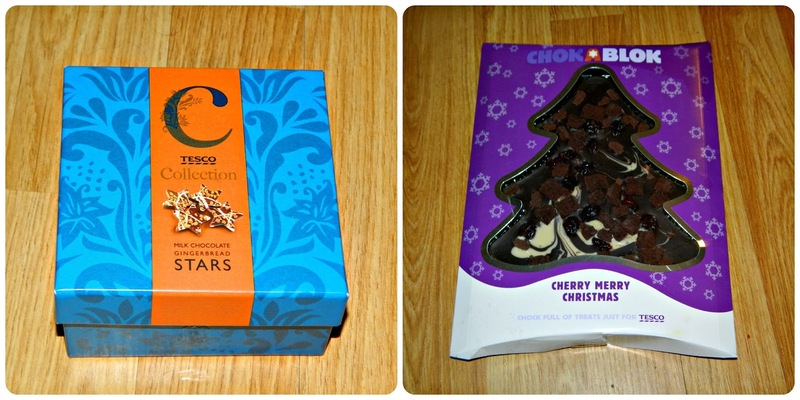 We received a box of Tesco Collection Milk Chocolate Gingerbread Stars and Chokablok Cherry Merry Christmas, which is available exclusively in Tesco. We first tried the Gingerbread Stars which are part of the Tesco Collection range. Made from milk chocolate they are thick, chunky star shaped chocolates which are covered in white chocolate, caramelised biscuit and ginger crumble. They are very attractive to look at and each box contains around twelve chocolates and weighs 100g. Each chocolate is probably around two inches in diameter. I'm a huge fan of ginger in chocolate and it is a flavour that I seek out but, I have to say, that I was slightly disappointed in the flavour of these. I was expecting a real punch of gingerbread flavouring but it was too subtle for my palate. The over-riding flavour is that of milk chocolate and the biscuit and crumble offer a pleasing texture. The packaging is beautiful - with a lovely blue and orange colour scheme and the chocolates wrapped in tissue paper inside so I was expecting the flavour to be a grown up one but I would say it is a better flavour for children. Bud has really enjoyed the chocolates but both my partner and I thought that they were not chocolates that we would buy for ourselves, and at £4 per box they are a little too expensive to indulge a three year old. The Chokablok Cherry Merry Christmas was, in contrast, a pleasant surprise. On opening my parcel from Tesco I was a little disappointed to have been sent this as, ordinarily, I don't like chocolate and cherry as a flavour combination although I do like them separately. I am a fan of Chokablok, however, so I was willing to see how they had combined the two. Presented in a christmas tree shape, the packaging is fun and attractive. It really shouts that it is a fun Christmas gift. The tree is around the size of a paperback book and the package weighs 150g. Chokablok have combined Black Forest Gateau dark chocolate, a white chocolate swirl, dried cherries and brownie pieces to great effect in this Christmas tree. I happened to have a glass of red wine to hand when I tried it for the first time and the chocolate was a great accompaniment. The presence of the dried cherries offers a pleasant sourness which cuts through the richness of the dark chocolate. There are two other flavours available in the exclusive Chokablok range - Cinnamon and Christmas Pudding - and I think I'd definitely enjoy both of those too. The packs are available in Tesco for £5 and I think represent good value for money as a stocking filler or small gift for a chocolate fan. Disclaimer: We received the chocolates for the purpose of this review. All opinions are honest and unbiased.